This morning, February 9 2015 at 9:25, Russian forces in eastern Ukraine claimed what was looming and inevitable seeing no change in tactics and steadily rising Russian ground forces since the beginning of January, but latest since the fall of Vuhlehirsk on February 4 – the pocket of Debaltseve closed and thousands of Ukrainian soldiers got trapped between the Russian puppet regime republics of Donetsk and Luhansk. What was the initial situation? During the last two weeks, Russian forces made steady territorial gains around Debaltseve, capturing for example Nikishyne, Ridkodub, Mius and the 8000 inhabitants town of Vuhlehirsk as well as overrunning the Ukrainian front in Chornukhyne only 6 km from Debaltseve itself. However, the Ukrainian central military command kept lying to itself, its soldiers and its citizens, claiming on its daily updated maps that nothing really changed and losses were not strategically important, demanding no change in policy (total offensive or withdrawal of up to 5000 troops, facing the danger of getting encircled). The below map shows the situation as described by the Ukrainian military command (left) and Russian invasion media (right). Despite the certain fact that the Russian map includes an element of exaggeration, it is much closer to reality, showing the almost-encirclement of all Ukrainian forces in Debaltseve and south of it. Meanwhile the Ukrainian map did not even “dare” to remove the Ukrainian flag from Vuhlehirsk, simply not talking about it anymore since the loss 6-7 days ago. 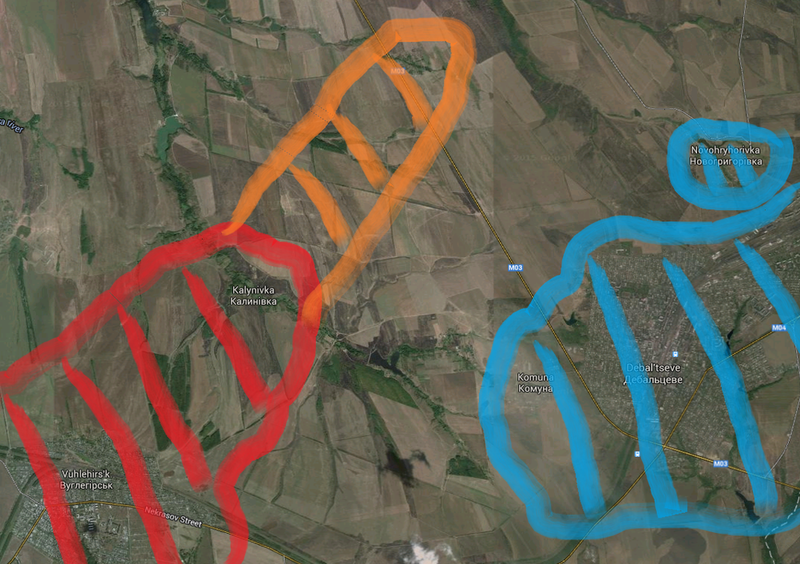 Then yesterday evening it was reported that Russian forces had pushed northward from Vuhlehirsk, taking Kaliynivka. I assessed the development in my latest article, predicting that if there was no immediate counteroffensive, Kalynivka would be the springboard to the E40 – the only lifeline to Debaltseve – just 3.5 kilometers away from it. It turned out, exactly this should happen within the next 24 hours. The map below shows the situation as it looked according to my analysis yesterday. Early morning today, strong Russian army forces departed from their strongholds in Horlivka and Yenakijeve (or came directly from the direction of the Russian-Ukrainian border), made a last stop in Vuhlehirsk and drove northward, passing yesterday-taken (and unchallenged) Kalynivka and head-on attacked the tiny village of Lohvynove which is the only settlement along the E40 between Luhanske and Debaltseve and possibly one of the weakest points of defense among the Ukrainian defense positions. It is possible that Russian forces also attacked from Nyzhnje Lozove to the north, but rather unlikely. There is an Ukrainian defense position (different from the south) and no footage available of fighting at that location, before reaching Lohvynove. Also,(unconfirmed) footage shows strong Russian army formations, passing rather urban areas “to the checkpoint” and thus probably coming from the nearby towns to the south and south west. Long before first pictures of the actual attack on Lohvynove were published by Russian state media and pro-Russian media groups in occupied Donbas in the late afternoon hours of February 9, I posted the first tactical map of how the situation might have developed according to reports in the morning hours and around noon, made by two Ukrainian journalists and two army sources on the ground. Then in the evening of February 9, the same disgusting procedure as always started with Russian state media airing (graphic!) footage of overrun Ukrainian positions, bloody Ukrainian POW and yelling Russian ground forces. 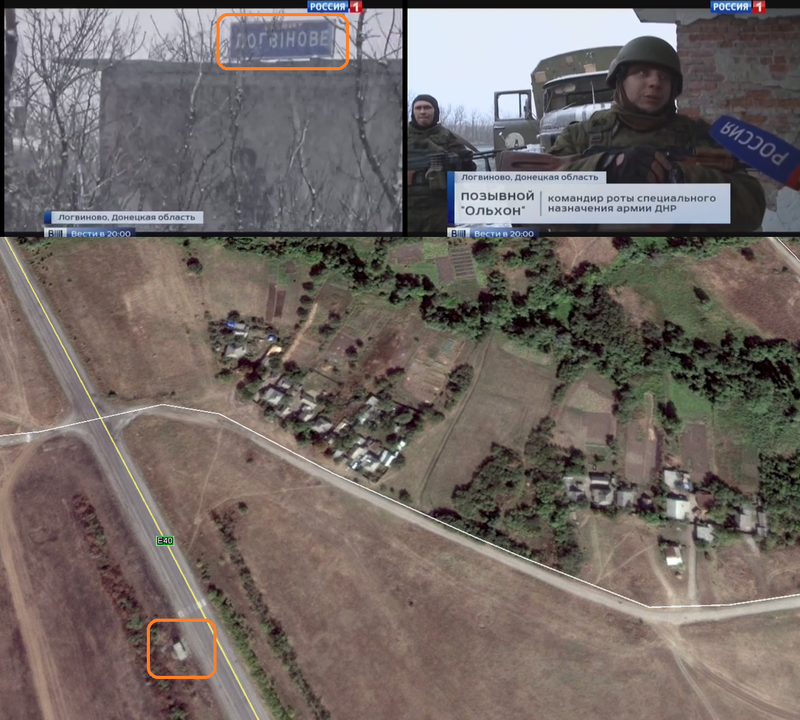 What is important about the footage however is that it – geolocated – proves that Russian forces indeed too Lohvynove and were – at least for some hours – in full control of it. Especially footage of the bus station along the E40 proved that they cut the “lifeline” of several thousand Ukrainian troops east and south east of it. More (graphic!) 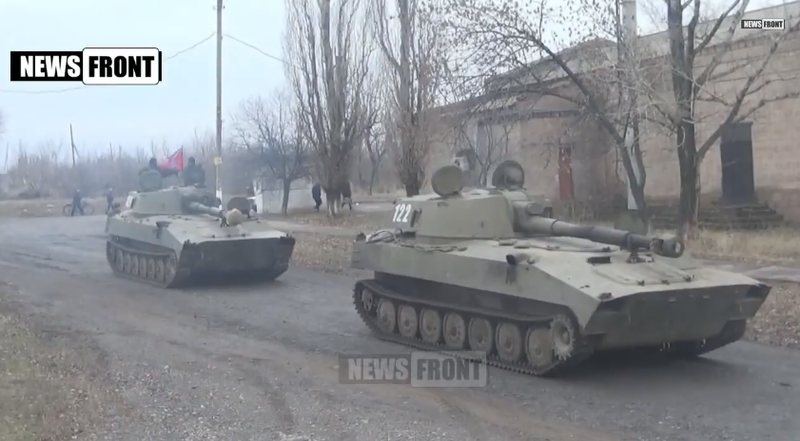 footage from another pro-Russian channel showed that the (filmed) forces indeed approached the village from the south, further continuing to the inhabited part of it on the north-eastern side of the E40. It also shows that the Ukrainian army claim of a “tank and apc” force is rather not accurate as dozens of marching ground troops can be seen in the footage, while only one Russian MT-LB is seen nearby. Over the whole afternoon and evening, the Ukrainian army claimed that it was “in full control of the entire E40/M04 between Artemivsk and Debaltseve”. This seems increasingly unlikely, especially as Ukrainian media in the evening hours quoted soldiers on the ground, reporting the pocket was closed and not only that; Russian forces had also entered Myronivka some 13 km north of the described battlefield, threatening a double layer around the Ukrainian troops in the bridgehead around Debaltseve and holding back possible reinforcements at the same time. Myronivka is located at the entrance of the Ukrainian promontory into Russian-held territory. A real cut of the E40 there would even trap 1-2 thousand Ukrainian troops more as it would also cut Svitlodars’k and Luhanske from the Ukrainian mainland. 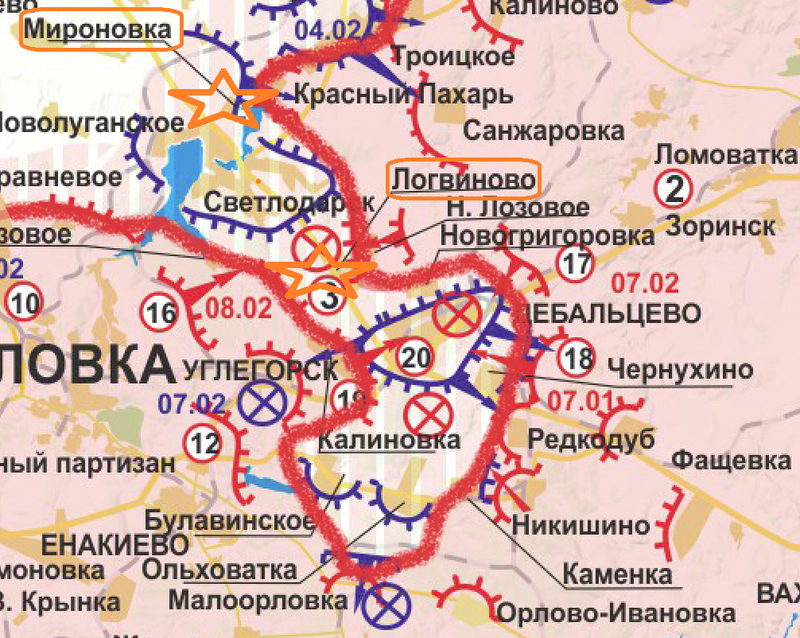 The below map, based on the pro-Russian version, shows where the two (reported) E40 cut-off locations are located and illustrates the looming disaster. Latest reports from an Ukrainian investigative journalist in the area confirmed fighting around Lohvynove into the late evening with Russian forces holding the village (blocking the E40) and Ukrainian army units trying to recapture it. The report also included another battle in the village Novohryhorivka, which was fiercely attacked over the whole day and on the verge of falling to Russian troops in the evening. If one or both villages remains under Russian control over the next hours, the journalist rightly concludes, the pocket would be closed. With the next Minsk talks (a pure farce against the backdrop of the Kremlin obvious and deadly aspirations to capture wide parts of Ukraine with 10.000s of troops and all brutality and willingness to sacrifice thousands of Russian citizens for that aim) coming on Wednesday, the Russian aim is to raise the stakes. Whether or not thousands of encircled Ukrainian troops will be part of the bargain at these negotiations, the Russian aim is to get full control over Debaltseve, being able to move on westward with thousands of own troops, now bound in and around the city. Looking at hasty ongoing Ukrainian efforts at this very moment, it seems not impossible that it will be able to breach the de facto pocket, which holds since 15 hours, in the coming hours. However if it does so, using all its reserves in the area, it will only be a question of hours or days, before even stronger Russian army reinforcements will push back the Ukrainian army forces and re-close the pocket. Observed Russian army Msta-S columns, a few kilometers to the north in Alchevsk, show what Putin is ready to invest to reach that goal. The battle around Debaltseve is decided, the pocket is closed right now, between 2000 and 5000 troops are besieged and the outlook is gloomy. Without an immediate and full mobilization, martial law, outside military assistance and intense international diplomatic and economic sanctions to bring Russia back to its senses, Debaltseve will fall within days and the entire Ukrainian frontline will collapse in a couple of weeks or months at max. Russia’s and its proxies’ aim is clear and openly admitted: The seizure of the entire Donbas. Once it has achieved that goal, no more military or moral boundaries will be existent to capture the rest of what it regards as “Novorossiya” reaching up to the borders of the European Union. This entry was posted in Ukraine and tagged Debaltseve, Donbas, Invasion, pocket, Russia, Ukraine by Julian Röpcke. Bookmark the permalink. The real disaster here is simply the fact that this was allowed to happen and that it was easily predicted by all observers paying even a minimum of attention to the situation – i.e. Ukrainian military leadership is by & large incompetent. In that sense the battle was lost before it was even fought. The only mitigating response I can think of – hypothetical – is that the UAF knows that pro-RU forces don’t have enough manpower in the area to truly seal the route, and that they have confidence of a breakout at least for evacuation if not continued supply. If that’s not the case though… again, complete ineptitude. I have a feeling that reluctance of some Western leaders to supply arms might be in part a result of abysmal Ukrainian leadership. They simply inspire zero confidence right now – the Ukrainian people deserve much better and will sadly bear the brunt of these failures. But closing the pocket is not enough, Ukraine does have significant forces in Debal’tseve and seem fairly well stocked with ammo and supplies to continue to hold out for a while. The more important question is what excuse will these Russian proxies use to avoid signing a broad agreement on Wednesday? A ceasefire makes no strategic sense for the Russian’s, especially now they have a large force of Ukrainians trapped and significant Russian artillery in the area, with more being brought to the area all the time. As for the Ukrainian response to this situation. I fear we will see another repeat of the failed counter offensive at the airport or Vuhlehirsk, where they will try to counter with woefully insufficient forces. The airport they tried a counter offensive with 10 tanks and 10 or so APC’s with only two tanks making the objective (what happened to the other 8 no one admits) and most of the APC’s either getting lost or breaking down. While all the time claiming they had an impressive force to, relieve, withdraw or reinforce the last defenders trapped in the terminal. Tonight we hear claims from the UA Government and General staff that Debal’tseve isn’t cut off and the situation is under control, just as we heard about the situation at the airport and ilovaisk. Well if they are so confident, I suggest Yatsenyuk, Turchynov and Muzhenko get in a civilian car and drive down the highway in broad daylight and prove the road is open and under UA control. Because anything less is just not going to be believed by either the Ukrainian people or the wider international community. The Ukrainian Army is fighting like the Syrian rebels that is ”hold on to the last man” but that strategy is not working any more because they will lose both men and weapons in the process, this pocket can be defended any more because the Pro-russiab rebels seem to have enough men and weapons in thearea, simply but, this Al Nusra front strategy and does not fit to standing army, full stop. I do not get this Ukrainian Army leadership or stategy. Like on purpose they tend to do utterly stupid decisions what will cause massive destruction along UK army. Year 2015 for solid defence line for relaying for trences and bunkers is so outdated. It will give easy targets to enemy artillery and armory. You will eventually run out men because of casualties and UK has even lesser training and equiptments. Why ou why they do not fight elastic warfare where they retreat and slow enemy to be ambushed and attacked from flanks and rear. Where are all guerilla troops to hit soft targets and pin point targets to artillery. Also good guerilla warfare could hit anti-air units and open possibility to use air force. Defending geografical locations is bad strategy. They should target enemy troops and let them move areas what favor UK arty ambush or attack. Deny them to move support units to help attacking units. Currently it seems that even western countries would provide weapons for UK army it will not change of path of war. If Ukrainian army cannot manouver and fight modern warfare there is no change to win this. Russia will provide as many troops as needed to push UK back. Only way to get good negotiation stance against russia is get good victory agaist russia troops, but with this setup I cannot see that it would be possible. There is credible information that the road has indeed been reopened by the Ukrainian military this morning. However I would agree with the assessment that it is unlikely they can hold it for very long. The question therefore becomes whether they take the opportunity to withdraw or only reinforce (until cut off again). Also the advance by Azov Batt. may momentarily distract the Russian Commanders. But they are likely to deal with this situation by introducing fresh units into Ukraine (which are available on the border), rather than re-deploying units from Delbatseve. Debaltsevo is a closed case.It was a closed case when the Russians got to a 4km distance of the highway.Now they are going to set up dozens of ATGM(Anti-tang-guided-missile they have ranges from 2km to 8km) and MG nest and pick off anything that moves on that route.They will spread there forces thin so artillery is of no use to the UKR army and there AA systems(Pantsir S1) will stop any resupply by air for the UKR army in the air.with the 2S7(67.5km of range with RAP) the 2S19(39km with RAP) and with the BM-30(90km range) the Russians will destroy any kind of forces coming from Ukraine.They will use artillery radars (the SNAR-10 Lynx) drones and satellite photos to pinpoint any UKR army column and destroy it before it even comes close to the front line(This is why the UKR forces don’t go in mass columns).This battle was over before it started.I always said they needed to retreat to a better position but the UKR army command seems to be out of touch wit reality.Pro-Russian separatists next stop will be Slavyansk. I also have ask, how did the Ukrainians let this happen? I have only 24 months of drafted military service behind me (in Norway), but we were quickly told the basic laws of any CO or NCO: “Retreat in the face of a superior enemy if you must, to preserve your forces. Terrain can be regained, casualties and lost equipment can not, it will have to be reinforced from a pool of limited resources.” This is especially true for the Ukrainians, which have very limited resources and are fighting a war about much higher stakes than the relatively small number of square kilometres the rebels control.